My Trek 1200 road bike - Run. Bike. Code. Happy Fourth of July for my American readers! The Tour starts tomorrow and that’s a good opportunity (as good as any other, to be fair) to write about my bikes. Since I have two road bikes, I’ll start with the older one, my vintage Trek 1200. 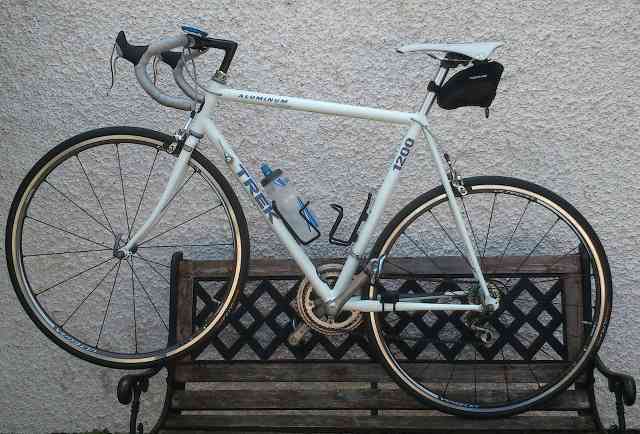 A vintage Trek 1200 aluminum road bike, 1990 edition (white with purple decals)! according to the list of serial numbers is in line with the year 1990. It was equipped with a Shimano RX100 groupset (that’s one down from the classic 105), with downtube shifters, a 7-speed cassette (11-23 if I remember correctly) and a 42/53 “biopace” chainring combo (“biopace” meaning slightly oval chainrings). 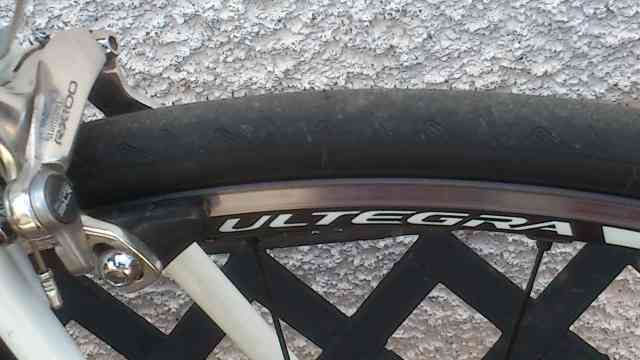 It came with Matrix 700C ISO C11 rims, which had a slight aero-profile. I upgraded the rear-hub to a Shimano 600 at some point, because I had a second rear-wheel designated for riding on the trainer and used the 105 equipped wheel for that. I rode this bike for all of my triathlon seasons (three, all in all). After I stopped doing triathlon races I remember one year during university where I got back on the bike for a few rides. After that, it sat in my attic, for years. In 2010, when I picked up cycling again, I had the bike checked by a local bike shop. They were surprised about the good shape it was in. All it needed was some lube, new cables for the brakes, a new saddle and new pedals (because I also got new shoes which had different cleats), and I was good to go. And it is still a damn fine bike to ride! Thanks for reading and enjoy your long weekend ahead! If you happen to have a vintage Trek bike, too, please leave a comment! Or if you don’t have one, but would like one, comment as well. Or you can also comment just because!